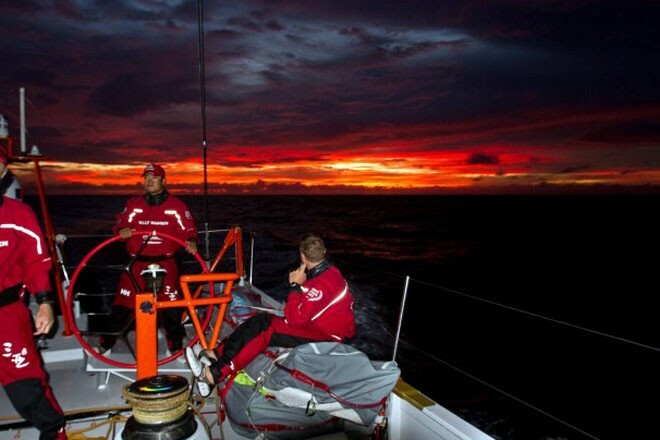 In the Volvo Ocean Race, Team Sanya spent a few painful days crossing the Doldrums and are now able to stretch their legs as the today blast towards the safe haven port where they will be reunited with the rest of the race fleet for the first time in over a month. A slight change in wind direction has meant the fast reaching of last night have turned into an upwind slog but Mason said the variety of conditions had allowed the six sailors on board to get to know their boat better. Under race rules, Team Sanya will pick up four points for Leg 2 Stage 1, one point for Leg 2 Stage 2 and two points for the Etihad Airways In-Port Race, providing they arrive at the safe haven under racing conditions. ‘We’ve been making sure we have a good laugh and plenty of fun on this trip but there is a serious business,’ Mason said. ‘We’re collecting points and we’re looking to re-engage the fleet. ‘The pressure is obviously on for us to pull a few good cards out seeing as we’re sailing to our home port of Sanya. There’s a lot of emailing back and forth to work out what we can and can’t do in the safe haven to get the boat back up to speed. We’re very focussed and quite frankly we’re really looking forward to it.